While you wait for a report on my sitting in line to get a book written in by the author, here are a few pictures from last night. I should have been cleaning or writing a paper on the influence of Aristotelian philosophy on the structure of Dante's Inferno and Purgatorio, but nature called to me (and not in the euphemistic way). Jimmy went to the part to catch frogs for biology class, but came home with two different animals, one intentionally caught, the other, QUITE unintentionally procured. Guess which one was which? Hayley has always been a tomboy. 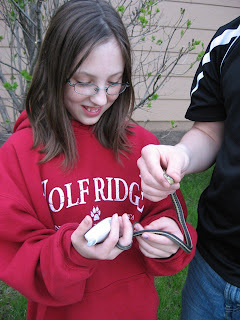 She'll do what the boys do, and if that means hold a snake, she'll hold a snake. She does have some girl in her too, as you can she she is also holding a phone. She liked the way the snake curled its tail around her finger. Jimmy is the holder of the snake's head. 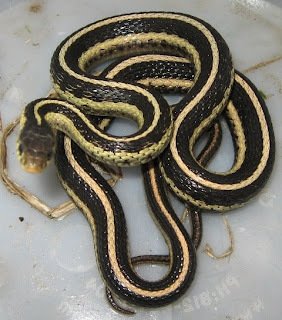 If anyone thinks garter snakes are not at all vicious, one did bite Jimmy years back, so he's a little leery of picking them up. But not leery enough not to do it. Just leery enough to want to hold the snake so it can't bite him. He released the snake into the yard. I don't mind at all. 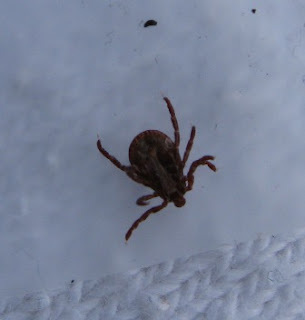 I did make him destroy the tick though. I got a major case of the heebies when Jimmy reported that he had a tick on his sock. Icky-ticky. They are such nasty creatures. But I do like snakes. It is nice to see Hayley is getting her money's worth out of that sweatshirt!! Oh geez, she wears it ALL THE TIME. Mom has forbidden her to wear it for piano lessons. I have to pry it off her to wash it occasionally.